Duck is the third most commonly produced type of poultry in the world. Whether you're using the whole bird, its meat or another one of its parts, duck can generally be considered a healthy food. This bird is rich in protein, essential omega fatty acids, and various vitamins and minerals. Duck is a healthy type of meat filled with vitamins, minerals and antioxidants. However, its skin is very fatty. 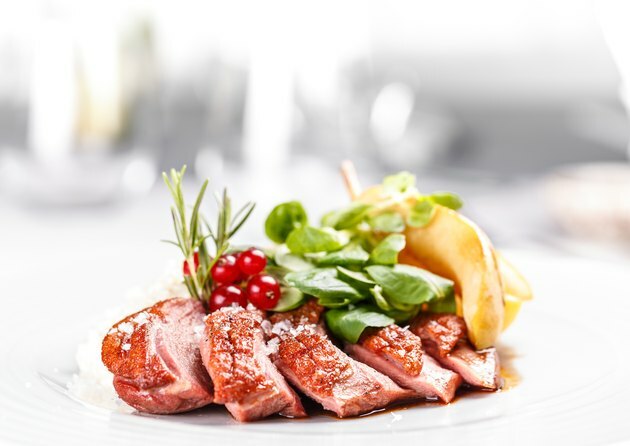 Find out more about the exact nutrition breakdown of duck on MyPlate. Small amounts of other minerals, like calcium and copper, can also be found in duck meat. In addition, duck meat contains healthy essential fats, like omega-3 and omega-6 fatty acids. The majority of duck's fat is found in its skin. While 100 grams of duck meat with skin has 39.3 grams of fat (61 percent of your DV for fat), removing the skin means your duck meat will only have 11.2 grams of fat (17 percent of the DV). Like most other foods, these nutrients may change based on the way you've chosen to cook your duck. However, although some vitamins and minerals may be reduced because of the heat applied when cooking, a 2014 study in the Journal of Food Science and Technology Research showed that antioxidants actually increase after you've cooked a duck by roasting it. The fat in duck meat has pros and cons. For someone on a low-carbohydrate or ketogenic diet, the high-fat content of duck might make it a favorite choice of protein. Most of the fats in duck are healthy monounsaturated and polyunsaturated fats, which are considered to be good for you. Despite this, consuming 61 percent of your DV for fat in just 100 grams of duck might sound concerning, especially if you're worried about your health. While heart-healthy fats like omega fatty acids are good for you, saturated fats aren't the best. Out of the 39.3 grams of fat in a 100-gram serving of duck meat with skin, 13.2 grams are saturated fat. The American Heart Association recommends limiting your saturated fat consumption to 5 to 6 percent of your caloric intake. This is because too much saturated fat can increase cholesterol and your risk of heart issues. The average person consuming a 2,000-calorie diet should consume about 13 grams of saturated fat a day — which means that a 100-gram serving of duck breast with skin is essentially all of your saturated fat intake. This might be OK occasionally, but if you like eating duck, you may want to take the skin off it — this brings its saturated fat down to just 4.2 grams. Like all animals, the nutrition of duck can be influenced by whether it's wild or farmed, or even just the types of foods it has eaten during its life. Farmed ducks commonly eat a variety of foods, including corn, rice bran, soybeans and fish meal, but ducks are, of course, exposed to many more types of food in the wild. A 2015 study in the Journal of Applied Animal Research showed that overfeeding ducks prevents them from absorbing nutrients, which in turn affects the nutritional value of their meat. This is important, since ducks and geese are often force-fed in order to produce specialty products like foie gras. Duck species can also impact nutrient content, especially regarding the amount of fat they contain. One example of a nutrient that changes dramatically is protein. While 100 grams of the average farmed duck has 23 percent of your DV for protein, wild duck's protein has 35 percent of the DV per 100 grams. Wild duck is also generally richer in all other nutrients except vitamins E and K, which it lacks. It also has less omega fatty acids. An interesting factor that can change duck nutrition is whether or not farmed ducks are incorporated into other types of farming. Increasingly, ducks are being used in fish farming and rice farming. Ducks can be used as natural "insecticides" and "fertilizers" on farms, with their waste even helping to support the nourishment of fish. Raising ducks in this way gives them regular access to plants and insects from a variety of sources, which can greatly impact their nutrition. If you're not used to cooking duck, you might confuse a whole bird for chicken, goose or pheasant. You'll often find duck breasts or legs butchered in similar ways to chicken and other types of poultry — but since duck meat is darker than that of most other birds, it can actually be easily differentiated from other poultry products. Unlike chicken, which is well known as a type of white meat, duck meat is red. Most chefs recommend that chicken and other poultry be cooked all the way through. However, duck is often cooked more like steak: medium or even medium rare. This isn't a hard and fast rule, though; anything you'd do to chicken, you can do to duck. Whether it's a pot pie, stir fry, dumplings or stew, duck meat can be used in just about any dish. Duck also has various uses beyond just its meat. Duck bones can be used to make bone broth for soups, like pho, while duck fat can be used as an alternative to butter. As with chicken, you can eat duck offal, turning livers into pâté or pan frying kidneys. You can even consume duck eggs, which are actually richer sources of vitamin B12 than duck meat.